Today there are believed to be around 20,000 beach huts in the U.K. 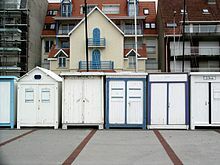 Locations where beach huts can be seen include Lowestoft, Southwold, Walton-on-the-Naze, Frinton-on-Sea, Abersoch, Langland Bay, Rotherslade, Rustington, St Helens, Isle of Wight, and Mersea Island. Locations in other countries include Wimereux, France, spectacular colorful picturesque in Cape Town, South Africa, Nesodden, Norway and Brighton and elsewhere around Port Phillip, Australia. Holhiashi are small Maldivian resting places usually found only in the Maldives. These small beach huts can be found near beaches or harbours. The noted bathing boxes at Brighton in Australia are known to have existed as far back as 1862. The bathing boxes are thought to have been constructed and used largely as a response to the Victorian morality of the age, and are known to have existed not only in Australia but also on the beaches of England, France and Italy and Cape Town at around the same time. They had evolved from the wheeled bathing machines used by Victorians to preserve their modesty. George III gave royal approval to the new fashion when he took a medicinal bath at Weymouth to the musical accompaniment of ‘God Save the King.’, while Queen Victoria installed one at Osbourne House on the Isle of Wight in the 1840s. ^ Savill, Richard (27 July 2007). "A monster price secures beach hut on Dorset's Jurassic Coast". The Daily Telegraph. London. ^ Allen, Emily (23 July 2012). "A (very) little bit of luxury: Britain's most expensive beach hut snapped up for a whopping £170,000 in just TWO days". Daily Mail. Retrieved 23 July 2012. ^ Avis-Riordan, Katie (21 July 2017). "This is Britain's most expensive beach hut and it's selling for £280,000". Country Living. Retrieved 31 May 2018. ^ a b c Frith, Maxine. The tide turns against beach huts as charges erode seaside property prices, The Independent, March 25, 2005. Accessed September 14, 2015. ^ Gillilan, Lesley (17 July 2009). "Britain still loves the beach hut". The Daily Telegraph. London. ^ Planet, L.; Masters, T. (2015). Lonely Planet Maldives. Travel Guide. Lonely Planet Publications. p. pt320. ISBN 978-1-74360-978-1. Retrieved April 8, 2017. ^ "History - Pre and Post European settlement to 1930". Brighton Bathing Box Association Inc. 2008. Archived from the original on 20 November 2008. Retrieved 14 January 2009. ^ "Home - The Brighton Bathing Boxes Melbourne, Australia". Brighton Bathing Box Association Inc. 2008. Archived from the original on 14 April 2009. Retrieved 27 February 2009. ^ Hickman, Martin. Seaside scramble: Britain's beach hut love affair, The Independent, July 31, 2006. Accessed September 14, 2015. ^ "Bournemouth beach hut chapel 'first' to host weddings". BBC news. 8 March 2011. Retrieved 9 July 2011.